When people ask if you had a nice weekend, they may be courteous, they may be curious, but I don’t think they expect a blow-by-blow retelling that takes as long as the actual event. But the question has prompted me to look at one particular weekend and consider just what it was that made it such a good one. First, I think, there was getting the front porch painted the wrong color on Friday afternoon, a happy accident because the porch now ties in beautifully with the interior trim, welcoming you into our home. “It looks much darker,” Laurie said, and I replied, “It’s wet. Wait until it dries.” But by gosh, it dried that color too, and then I went back to the basement and there was the “other” can of deck paint, waiting patiently to go outdoors. Hey, it’ll fade, and there’s still the back deck to get it right. Saturday morning, Laurie and I took a long walk without Gus, and since neither one of us stops at every tree or eats things we find in the grass, it was a refreshing stroll. 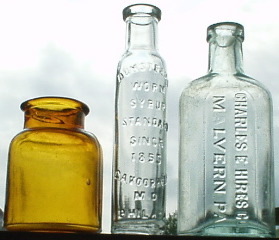 We stopped in a new antique shop here in the Village and I found three treasures: an amber colored snuff bottle, a blue Charles Hires root beer extract bottle, and the gem, a clear glass bottle that was once a vessel for Bumstead’s Worm Syrup. I had never dreamed I would some day own a worm syrup bottle, and it brought home to me how many surprises life may still have in store. I would happily have gone on wandering, but it was time to drive to Rochester for a wedding. We explained to Gus that the young Tristan Whitehouse he had met and jumped up on the day before would arrive at dinnertime to feed and walk him, and that we would be back in person before bedtime. He gave us his best “Are you sure?” expression, and we did a lot of nodding and made earnest promises in reassuring tones. I had burned a new CD for Laurie so she got to listen to that while I drifted in and out of consciousness on the Thruway, snapping out of my stupor just in time to tie my bow tie, pass over the cash for the toll, and read aloud the directions into the Flower City. The wedding was at a Lutheran church; a young woman we had known since the age of five was now all of 22 and tying the knot. This was a Silver Bay relationship, a family we eat three meals a day with for one week every summer, who we have now known for 17 years, or 17 weeks, depending on how you count it. It is always jarring for me to see people out of context, to realize they have lives in other places. And the wedding apparel for the parents of the bride was significantly different from Silver Bay’s more casual wardrobe choices. The day was perfect; the bride was beautiful; the ceremony was lovely. At the reception, our table was populated with friendly and interesting people. The gentleman to my right had a wine obsession similar to my beer obsession, and in a wandering conversation we compared notes on vintages and the chances of getting into a National Guard unit in 1969. We arrived home at 9:30 p.m. and Gus was wildly happy to see us, insisting that we stay up late so he could pack in all of the play-time and sofa-time he has come to expect each evening. And we still had a church picnic to look forward to (two hot dogs, thank you, as I prepare for a summer of Doubledays baseball) and an afternoon at home, Vanilla Coke, a movie with dinner, grilled cheese sandwiches. And before going up to bed where Winston Churchill would tell me about World War II, I would make one more stop at my bottle case for a long look at the slender, clear bottle that once held worm syrup.